Disappeared News: Take this quiz by The Guardian: can you tell the difference between Bush and Obama? Take this quiz by The Guardian: can you tell the difference between Bush and Obama? The Guardian has posted an interesting quiz: Can you tell the difference between George W. Bush and Barack Obama based on their statements on the Patriot Act alone? 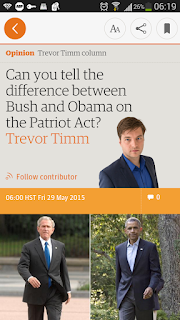 Their quiz works nicely on your Guardian smartphone app, or on their web page: Can you tell the difference between Bush and Obama on the Patriot Act? I did only moderately well. Give it a try. After completing the quiz, I felt more than ever that we need to move our view of American politics from a simplistic Republican/Democrat dichotomy—or, for that matter, from a conservative/liberal split. It’s possible to have a Democrat as President who deports in record numbers, who bombs and kill civilians, and who has no interest in punishing crimes committed by bankers or politicians. It’s possible to have Democrats who are fiscal conservatives. It’s always been possible, at any time in our history, to learn that American presidents of either party have lied to the people. Historically, we can find Republicans who supported civil liberties or who opposed the military-industrial complex, or who opposed extension of government spying on its citizens. And so on. When we vote, we’re often boxed into a corner by having to identify ourselves as Democrat or Republican. It’s built into the system. But where in the Constitution are these two parties specified? Over time perhaps, citizens will find other, more significant, ways to distinguish between or among our leaders or potential leaders. That could be a long time, though, if it happens at all. The national character seems to be to form a dichotomy and then line up with one side or the other. That’s tough to change.